3,2,1, Party Time! New Year’s Eve is just as exciting for kids as it is for adults. Sometimes, though, it can be hard for kids because they want to stay up as late as everyone else and party like it’s 1999, too. Whether they’re allowed to stay up until midnight or not, make New Year’s extra special for the kids this year with 27 Kids’ New Year Crafts and New Year’s Eve Food. New Year’s Eve will be incredible this year no matter what time the kids go to bed! They’ll have an exclusive New Year’s ball drop in your home, get to wear fun party hats, and get to partake in New Year’s resolution activities. A full New Year celebration! When the clock strikes midnight, or whatever time you’ve decided is the moment of truth, pop pom poms, crack confetti, and make lots of noise with kids’ New Year crafts. Don’t stop the party there! Celebrate the New Year with some amazing New Year’s Eve food, like a lucky pretzel or pizza dip. Pizza dip is a thing? Sounds like an amazing way to ring in the New Year! Remember that New Year’s is more than just a party, though. It’s a time to reflect on the past year and make some changes for the coming year. The kids can help your resolutions come true with kids’ New Year crafts that help tidy-up. With this kind of celebration, next year is sure to be the best year ever! If you are looking for more winter boredom busters, check out our free ebook: 11 Winter Crafts for Kids + Outdoor Activities free eBook. Kids will love celebrating winter with this fun collection of chilly weather themed crafts. Make some noise; it's party time! 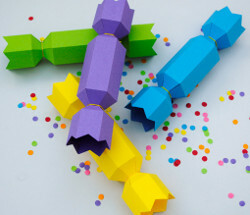 This collection of kids' new year crafts will ensure your New Year's party will be the best. When the kids make these fun new year crafts, it will be full of confetti, pom poms, your own New Year's ball drop, party hats, wish pillows, and, of course, noise. The kiddos will never forget this party, which means you have a lot to live up to from now on! They will have such a blast and will be talking about this party until, well, next year. Little chefs will love helping make New Year party food, and everyone will devour the festive treats. Below you'll find kid-friendly food for the best night of the year. Kids will be delighted as they tell time with a quesadilla, munch a lucky pretzel, and satisfy their sweet tooths with Oreo pops. Start on your New Year's resolution right away by making orginzational crafts even before the New Year strikes. These kids' New Year crafts will help declutter bedrooms, craft rooms, and kitchens. For even more New Year's Party crafts, DIY party decorations and inspiration, check out our collection: New Year's Eve for All Ages: 14 DIY Party Decorations and New Years Crafts.